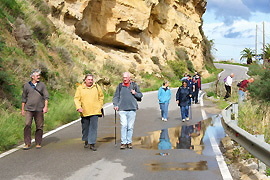 CIC Treasurer Ralph Krüger arranged for us this hike from Rethymnon-Kastelakia via Agia Irini to Roussospiti. 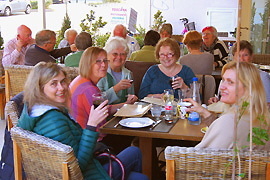 At Agia Irini we had a tour of the nunnery there, and at Roussospiti we met our non-hiking members in Taverna Mylonas for a late joined lunch. 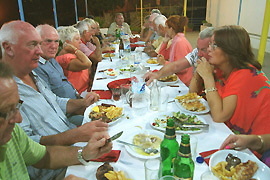 CIC Treasurer Ralph Krüger arranged this month's joint dinner for us. Kostas and Dina from Pikris joint us for the first time. In the second half of September, evenings can be rather chilly up here in Roussospiti. CIC Vice President Ingo H. Dietrich arranged this carpool excursion for us. 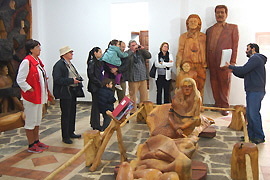 In Axos, Georgios Koutantos showed us his Wooden Sculptures Museum. In Anogia we visited Georgios Skoulas in the museum of his father Alkibiadis, and had our coffee break in the kafenion of his brother Michail. Then we went to the El Greco Museum near Fodele which is not easy to find and did not inspire anybody at all. There is not a single piece by El Greco, instead an epic presentation of the local politicians who initiated this poor exhibition. At our last stop at Taverna Tzagaris in Drosia, the suckling pig reimbursed us for the El Greco Museum. Former CIC Secretary Kath Walls decided to return to England. Just before leaving she met with friends for dinner at Taverna Toscana (which does not exist anymore).